I had this question posed to me twice in the last few months...once via e-mail and once via my Facebook page. Both questions wondered about the history of the "Red Rider" nickname. It's a simple enough question, but one that I wasn't really sure of myself, so I thought I'd try to find out for myself and share it with those who didn't know (myself included). We all know and love the "Red Rider," and I think a lot of us appreciate it's uniqueness. Martins Ferry in southern Ohio call themselves the Purple Riders and Texas Tech are the Red RAIDERS (something we've been mistakenly called many times), but other than the Canadian rock band that gave us Lunatic Fringe (the all-time greatest pre-game football song), and the BB gun made famous in The Christmas Story movie, the term 'Red Rider' is very native to Orrville. According to this link at the OHSAA, we're the only 'Red Rider' in the state, and quite possibly, the nation. (A commenter correctly points out that there is another Red Rider in the country. It's Weir High School in Weirton, WV. What's even more odd, is that their helmet logo is exactly the same as our rivals in Wooster. That's all fine and good, and a lot to be proud of, but where did it originate? I'll do my best to lay it out, and some of the other theories that have been documented over the years. My first source was the bible of local football, Mike Vasas' "A History of Wayne County High School Football, 1899 to 1988." Along with a football history of every county school, he dedicated a paragraph to discuss nickname history for each team he could find definitive documentation about. Here's the text from the section on Orrville's nickname origin, found on page 107. This has been one of the most difficult nicknames to track down. Supposedly, it was the brainchild of two Orrville students in or about 1931, but the source cannot be verified. There are two assumptions concerning the name. Some have related it to the fact that Orrville was an early horse trading town while others felt that the name conjured up a worthy adversary to the school's arch rival's from Wooster, whose own nickname featured a General on a white horse. An interesting sideline is the fact that there was an old-time cowboy cartoon called Red Ryder, and the name of his Indian sidekick, Little Beaver, became the nickname for the younger Orrville teams of that period. Another note was added by the author on page 115. The Orrville athletic teams were called the "Red Riders" at least as early as 1931. Prior to that time, they were often referred to as the "Big Red." Lots going on here...I'll make sense of it in the next couple of sections. 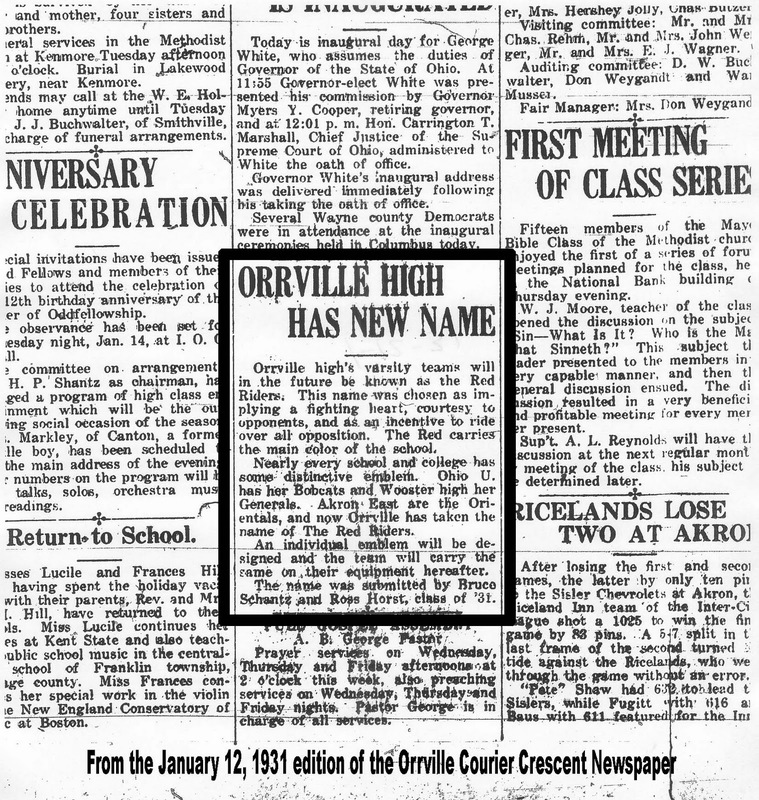 Knowing that the Red Rider name was made official in 1931, I headed off to the Orrville Library to browse old editions of the Courier Crescent (which became the Orrville Journal, which became OrrViews) on microfiche to see if I could locate an announcement of the new identity for Orrville High. Luckily, the announcement was made in January (at the beginning of the reel of film). Here's what I found, and what we can call factual going forward. #1 - The "Red Rider" nickname became official in 1931. It was announced in the January 12, 1931 edition of the Courier Crescent. See the entire article below, click for a full size version. The one big question I had and still have is...why? Was Big Red too common back then that we felt it necessary to establish a unique identity? Was it a contest, or just something that was offered up by these two students. 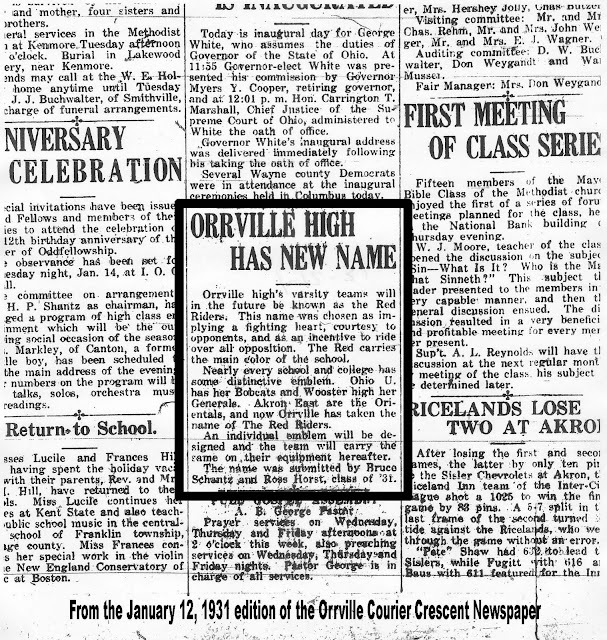 #2 - The above article also confirms the fact that the name was indeed submitted by two Orrville students, Bruce Schantz and Ross Horst, specifically, of the Class of 1931. #3 - The first use of the "Red Rider" name in print was also in the 1/12/31 issue reporting on a rare win over Wooster in basketball. #4 - We were called the Big Red, or Big Reds, before we were the Red Riders. Again, staying in 1931, just a week before the name change to "Red Riders," were these two articles referring to us as the Big Red. Love the 'old fashioned' writing in those articles. So much to soak up. So the name was coined in January 1931, or at least made known to the public then. We're in January 2011 now, an exact 80 years since the 'Red Rider' name was born. How cool is that? 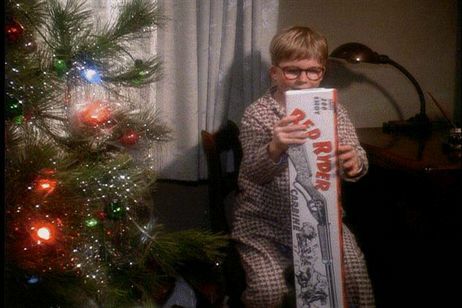 According to Wikipedia, the Red Ryder comic strip didn't first appear in newspapers until 1938, so the naming of the Orrville Red Riders in 1931 by Schantz and Horst predates that, but it's entirely possible that the youth teams of Orrville in the 40's and 50's were officially or unofficially called the "Little Beavers," as the theory in the Wayne County Football History book states. As far as the other theories that the 'Red Rider' name was derived from Orrville's tradition as a horse trading town and an answer to the Wooster General....I guess it's possible, and maybe even likely...but I haven't found anything official to support it. So there you go. The birth of the Red Rider. If you have anything to add, please use the comment section to your liking. I'm hoping I got this right, but as always, maybe there's more out there. If you have pictures or information, please share. If you had pictures or scans of some of our early logo designs, I'd love to take a look at that too. yep, graduate of Weir High School here...Home of the Red Riders...at least the WV home....not sure i've heard of any other high school nicknamed that way other than Orrville...very cool!